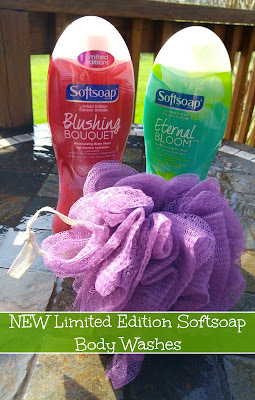 One Momma Saving Money: NEW Limited Edition Softsoap Body Washes out now! NEW Limited Edition Softsoap Body Washes out now! These are some amazing scents and perfect for the warmer days. The smell of the pears and apple in the Eternal Bloom will fill your bathroom with such a beautiful soft scent. It is by far my favorite! The Blushing Bouquet will fill the shower with beautiful floral scents while leaving your skin super soft. These two scents are the perfect way to start your morning off. Wake up to some beautiful scents and start your day right! Blushing Bouquet - Transform your shower into a sensory escape with the new limited edition Blushing Bouquet moisturizing body wash. The calming scent of May Blossom will captivate your sense, while the moisture rich formula leaves skin soft and radiant. Eternal Bloom - The perfect balance of fruity and floral, usher in warmer weather with the new limited edition Eternal Bloom moisturizing body wash. Watch the season bloom before your eye with the refreshing fragrance of pear and apple blossom, while the moisturizing formula leaves your skin feeling soft and smooth. Looking to save some money? Check out the coupons here and pick up your favorite scents today!